We challenge you to find a better location. Few addresses can place you so exactly in the center of entertainment. Few towers can so dramatically alter a skyline and elevate a cityÂ’s architectural standards. Few properties can create a new way to game, a new way to relax, a new way to play, indeed, a new way to experience the city you love. The Cosmopolitan Resort & Casino is creating a new paradigm of Las Vegas living at one of the most sought-after addresses in the world, the corner of Harmon Avenue and the Las Vegas Strip. 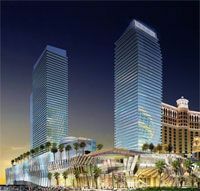 Following the groundbreaking in October 2005, The Cosmopolitan finalized construction financing through Deutsche Bank in January 2006. Since that time, the development has made significant progress. In the summer of 2006, Perini Building Company began a massive excavation of the site, removing an unprecedented 800,000 cubic yards of earth, making way for a 4,000-car subterranean parking garage. By January of 2007, the project will go vertical with concrete and steel and it is projected to open in early 2009. Condo-hotel residences at The CosmopolitanÂ’s 700-unit Tower at The Beach Club have been in high demand. Following the record-setting sell-out of the 1,300-unit West Tower, this is tremendous news for the market. Adjacent to the Cosmo Beach Club, the Tower features elegantly appointed Studio, 1-bed- room and penthouse condominiums with plush, designer interiors, marble bathrooms, flat-screen televisions and spacious terraces. Floor-to-ceiling windows will frame breathtaking views of the famed Bellagio fountains, the Eiffel Tower at Paris Las Vegas, the skyline at New York, New York, the Mandalay Bay Resort and the majestic Red Rock Canyon. Elevators from the Tower will connect directly with high-end shopping, state-of-the-art convention and gaming spaces, a 1,800 seat production theater, and the freshest collection of restaurants in Vegas. "The Cosmopolitan represents a new era in Las Vegas development," says Ian Bruce Eichner, visionary developer behind The Cosmopolitan. "We're building something different on The Strip, the likes of which Las Vegas has never seen before and may never see again. The sheer 'verticality' of this development as it towers 600 feet above The Strip is more akin to the urban terrain of Manhattan, or other cosmopolitan cities around the world." Eichner, has spent more than 30 years developing renowned luxury high-rise residential, office, hospitality, and retail space in such prominent locations as Manhattan and South Beach Miami.